Earlier this month, The Witcher 3 finally received NVIDIA Ansel support, which allows players to capture in-game shots and view in 360. A few hours ago, support for this technology has been added to the popular puzzle game The Witness, developed by Thekla. The Witness Ansel support, which is now available for the PC version of the game, allows players to take super-resolution screenshots, 360-degree panoramic screenshots and tweak images for brightness, contrast and more. Plenty of post processing filters are also available. Just like for The Witcher 3, players will require a supported GPU to enjoy the features offered by Ansel technology. The most recent NVIDIA GPUs are fully supported, like the GTX 1080, GTX 1070 and GTX 1060, as well as the mobile GPUs such as the GTX 980m, GTX 970m and others, so you won’t have any trouble if you have a relatively recent graphics card. The full list of compatible GPUs can be found on NVIDIA’s official website. 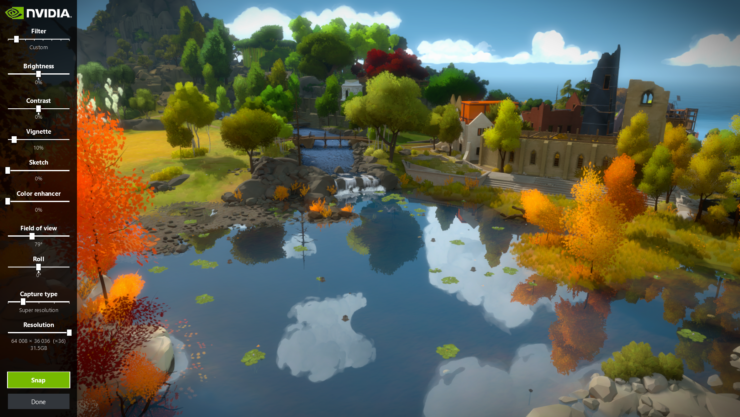 The Witness has been released earlier this year on PC and PlayStation 4, and it has been almost universally acclaimed as one of the best puzzle games released in recent years. In our own review of the game, we have noted how the game comes with a beautiful atmosphere, and interesting narrative style and challenging, yet fair, puzzles. The Witness is now available in all regions on PC and PlayStation 4.